The duo of acts opened their tour on Monday night (May 25) at the Borgata Events Center in Atlantic City with two lengthy sets of hits totaling 38 songs between them. Fogerty's set was, as normal in his later years, concentrated on the songs of Creedence Clearwater Revival with 15 of the 24 songs coming from their amazing body of work in just 1969 and 1970. 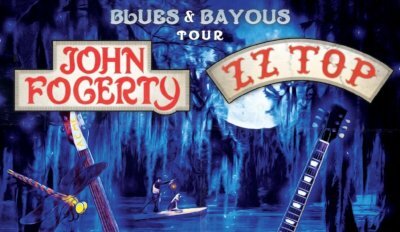 Fogerty also invited Billy Gibbons on stage with him to do their upcoming single "Holy Grail" along with "Bad Case of Loving You (Doctor, Doctor)". ZZ Top's set was mainly songs from between 1973 and 1983 with the exception of "I Gotsa Get Paid" from their last album, 2012's La Futura and their recent cover of "Sixteen Tons".